How does one perform a bot for a live audience? The obvious response is to simply read the text out loud, an effective method that produces an embodied experience of its output, but that would only share a limited portion of a bot. As autonomous computer programs deployed in Twitter, the output these bots generate may arise from one or several processes occurring over time, triggered by a timer or a set of conditions. Bots can draw from a wide variety of data sources, such as streaming APIs, online dictionaries, data repositories, collections, or their own data source. The bot's Twitter account could be considered a character (or poetic speaker), and is often personified or portraying an animal, robot, concept, or simply an account. The bot is therefore a work that consists of one or several concepts, software, data sources, a Twitter account, and the output it generates. As Darius Kazemi describes in a recent interview, his bots create "an overall shape over time" so he defines "a possibility space" for the bot to explore with its output. To read a single tweet is to see a single iteration within that space, and the more one reads its output, the richer the mental mapping of that space becomes. So how can one perform a bot for a live audience in a way that fully evokes the work of art it represents? I have been asking this question for several years now, and my (mostly collaborative) performances have sought to represent bots as fully as possible. "A Bot Choral" Off-site e-lit reading at MLA 2014 conference. Flaxman Library, Chicago. January 10, 2014. "Bot Intermissions" Game Over: The Fun and the Fury of Electronic Literature. Doheny Library, Los Angeles, CA. November 6, 2014. "A Bot Sampler in Two Voices" Reading at ELO 2015 conference. Egget Auditorium UiB, Bergen, Norway. August 5, 2015. The first and last of these performances were submitted as proposals and involved collaboration, while the "Bot Intermissions" were more impromptu interventions during an e-lit reading event I was co-hosting with Mark Marino. "A Bot Choral" was a collaborative reading organized with Zach Whalen, Roger Whitson, and Mark Sample (who was unable to attend), described as follows in the proposal. This 10-minute performance will feature four scholars reading from a Twitter stream set to feature the output of multiple bots, including some created by the scholars themselves. Each reader will select several bots to read out loud, and the reading sequence will be determined by the curated Twitter stream, which will be displayed live on screen. The resulting juxtapositions should be both humorous and thought-provoking, with the individual readers' voices lending continuity to the bots. During the performance, there will be a few moments in which a reader focuses on the text generated by a single bot, in the tradition of a solo riff. This fun performance should raise awareness of a growing emergent e-lit genre: the bot. 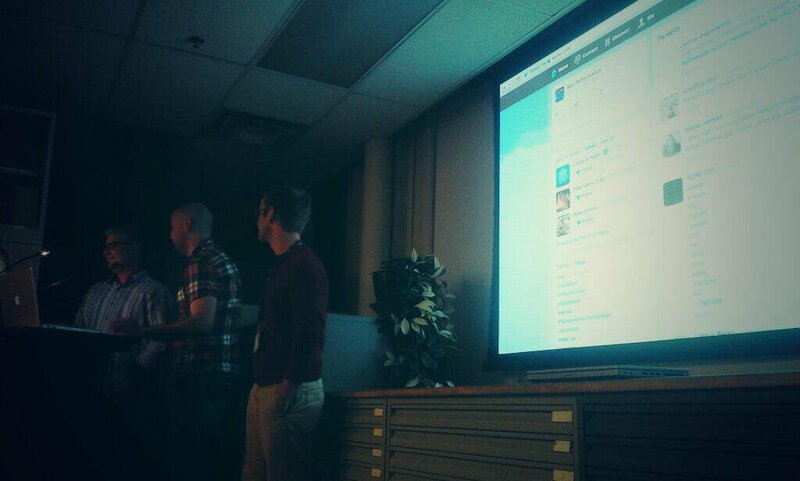 This performance focused on the experience of multiple bot outputs as manifested in a Twitter stream. To recreate that, I created a Twitter account titled @BotPerformance and followed 54 selected bots. For the performance, Whalen, Whitson and I established a simple algorithm for our performance: we would take turns reading a tweet each, but when a tweet generated by a bot created by Whalen or Whitson came up, then the creator would read it. After reading from @BotPerformance's Twitter stream for a few minutes, we selected a few of the bot accounts and read its output exclusively, still taking turns to read individual tweets. We were reading from a computer screen, which the audience could also see projected behind us (see Figure 1). Figure 1: 'A Bot Choral' performance (left to right: Leonardo Flores, Roger Whitson, Zach Whalen). Image credit: Electronic Literature Organization. Focusing on individual tweets from many bots didn't offer much context, and the audience had very little time to determine what they could about the bots' personae and goals from the profile picture and account name visible in each tweet. Reading multiple tweets from individual bots had a more powerful effect because the cumulative effect of the bot's output allowed the audience to mentally map some of the possibility space for each bot. We did focused readings from @YouNeverDidThe, @BillBlakeBot, @pelafina_lievre, and @SaveHumanities. Using the Twitter stream offered raw bot output, which was fine, but (a) it didn't necessarily offer the best output produced by a given bot, and (b) it focused on bots that post more frequently. I sought to address some of these issues in my second bot performance, an impromptu affair prompted by co-hosting The Fun and the Fury of Electronic Literature e-lit reading with Mark Marino. As we started the show I realized that there was a 5-minute technical setup gap between readings, so I selected some bots to read during these intermissions. While the technical setup occurred behind me, I used one of the microphones to briefly explain a bot's name and conceit and read some of its output from my iPhone. This allowed me to offer context and a reading of output selected on the spur of the moment from the bot's Twitter stream. The performance also focused on my verbal delivery, which was more emotional and inflected than robotically flat. I wanted to highlight the creatively interpretive act of reading, in effect hosting the bot's output in my body, as informed by Pinsky's theory. For example, try reading aloud these two tweets by one of Darius Kazemi's bots (see Figure 2). Figure 2: Two tweets by @YouNeverDidThe bot. To perform this exact same sequence of words using different punctuation requires different inflection, pauses, and rhythms. Kazemi's bot shows us how powerful punctuation can be, but this punctuated language is incomplete without a voice (even an inner voice) to make it come come alive. This is why partly why bots thrive in social networks — their output appears mixed with language written by humans and is initially apprehended as such — provoking surprise and delight upon the realization that it is bot generated. And the human/bot line is often blurred because bots frequently draw upon human writing as a data source. To explore these ideas further, I proposed "A Bot Sampler in Two Voices" as a collaborative production with Mark Sample for the ELO 2015 conference and festival at University of Bergen. For this media arts show, we prepared a slideshow (available at http://www.slideshare.net/leonardoflores3/a-bot-sampler-in-two-voices), which consists of an introduction (written from 48 individual tweets by @everyword and @everycanontroll) and the Twitter profiles for 11 bots (@pentametron, @Shark_Girls, @HaikuD2, @SaveHumanities, @YouNeverDidThe, @JustToSayBot, @wikisext, @WhitmanFML, @BotCarrion, @John_Cage_Bot, and @FavThingsBot). During the opening I changed slides rapidly as I read each word to illustrate and playfully engage the breadth and limitations of @everyword's vocabulary while I introduced the concept of bots to the audience. For the rest of the performance, Mark Sample and I displayed the Twitter profile for each bot, reading its description and pinned tweet (if available), and kept that slide on screen as we read from our own list of 5-7 selected tweets by that bot (see Figure 3). Figure 3: 'A Bot Sampler in Two Voices' (Left to right: Leonardo Flores and Mark Sample). Image credit: Davin Heckman. We alternated slides and bots, until the finale, which consisted of a minute of silence (we considered 4'33" but it was too long) during the @John_Cage_Bot slide and an a capella singing finale with @FavThingsBot (to the tune of "My Favorite Things" from The Sound of Music). This performance fully addressed the ideas I formulated earlier. 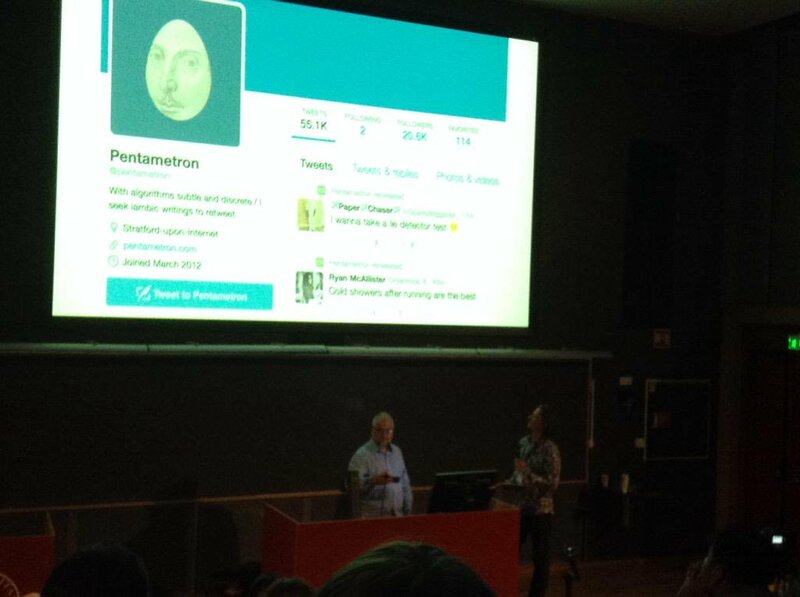 By offering the author's conceptual framing using the bot's Twitter profile, the audience had a sense of what to expect. By selecting some of the bot's output, Sample and I were able to offer a targeted mapping of each work, so that each audience member could form "an internal mental model of the shape of it and what it does" (Kazemi). And by performing them in an inflected, embodied, multimodal way, we were able to offer our own interpretation of, and enthusiasm for, the works. Flores, Leonardo. "Bot Intermissions" Game Over: The Fun and the Fury of Electronic Literature. Doheny Library, Los Angeles, CA. November 6, 2014. Flores, Leonardo, Roger Whitson, and Zach Whalen "A Bot Choral" Off-site e-lit reading at MLA 2014 conference. Flaxman Library, Chicago. January 10, 2014. Flores, Leonardo and Mark Sample. "A Bot Sampler in Two Voices" Reading at ELO 2015 conference. Egget Auditorium UiB, Bergen, Norway. August 5, 2015. Pinsky, Robert. The sounds of poetry: A brief guide. Macmillan, 1999.